carrying us41/301 over the manatee river in bradenton. Bradenton — A man who attempted suicide by jumping off the DeSoto Bridge only suffered minor injuries after Bradenton police officers rescued him from a piling below the bridge. At 10:48 a.m. Saturday, police officers were dispatched to the top of the Desoto Bridge after a 911 caller reported seeing a man jump off the top. The man was treated for minor injuries and then involuntarily hospitalized under Baker Act, according to Thiers. Palmetto Police also responded to assist. MANATEE -- A 61-year-old woman survived after jumping off the DeSoto Bridge into the Manatee River in Bradenton in a suicide try about 10:20 a.m. Wednesday, according to Bradenton police. A 911 caller reported the woman jumped off the southbound side of the bridge. Moments after jumping, the woman was rescued by a man who had been test driving a jet ski. She was later taken to Manatee Memorial Hospital where she is being evaluated, according to Bradenton police Lt. Brian Thiers. The woman appeared to have a broken arm and scratches, police said. The right lane of traffic on the southbound side of the bridge was blocked until about 11 a.m. when the woman's red 2008 Mazda Z3 was towed. Michael Mastroianni, 26, and Jeromy Dahlem, 31, were loading two jet skis they were testing for customers at Action Kawaski in Bradenton onto a trailer at a boat ramp near the DeSoto Bridge. A woman who saw the jump ran and told them. The men quickly unloaded a jet ski off the trailer, and Mastroianni rushed to where the woman was in the water. "I pulled up to her and she was floating in the water. I told her to jump onto the ski," Mastroianni said. "She was a bit hesitant, but she didn't want to swim back to shore." He helped her onto the back of the watercraft and drove back to the boat ramp. The men said she was bleeding a lot and it looked like she hit rocks in the river. "She was just having a bad day, it looked like," Mastroianni said. The men and police on scene described the woman as feisty or angry after the rescue. One witness said they saw the woman before the jump. Stephen Jordan was driving behind the victim when she suddenly stopped her car, got out, opened her trunk and appeared to search for something. Jordan got out of their car and asked the woman if she was alright. "She said something I couldn't make out," Jordan said. "Before I could say anything, she threw off her sunglasses and jumped off feet first." The victim appeared angry or upset, said Jordan, a nursing student. "It seemed like she was going through something," Jordan said. 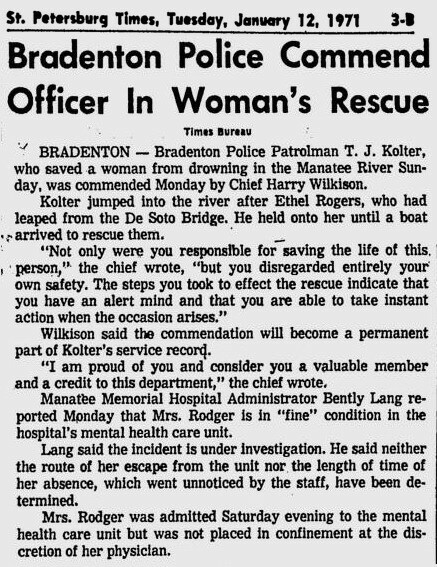 04.20.15, bradenton.com, firefighters rescue woman who jumped from DeSoto Bridge in suicide try. BRADENTON -- Bradenton firefighters early Monday rescued a 23-year-old woman who tried to kill herself by jumping off the DeSoto bridge into the Manatee River, according to Bradenton police. About 5:36 a.m., officers responded to the bridge after the woman drove to the top of the bridge and climbed over the eastern guardrail. Law enforcement officers tried to talk to the woman while she was on the bridge. She did not respond, other than to say she wanted to die. She then jumped off the bridge, according to a police report. The current carried the woman towards the day dock on the Bradenton Riverwalk, where firefighters pulled her out of the water. The woman was taken to Manatee Memorial Hospital, where she was in critical condition. Police said she was expected to recover from her injuries. 03.03.14, bradenton.com, Bradenton police Monday were able to prevent a distraught Manatee High School student from jumping off the Desoto Bridge, according to a report. AAbout 2:49 p.m., the 19-year-old student, who had lost his job, rode a bicycle to the Desoto Bridge, which carries U.S. 41/301 over the Manatee River, and threatened to jump off over the Riverwalk skate park, which is completely paved with concrete, police said. An officer on the Riverwalk detail began a conversation with the student from below. Two other officers arrived on scene and were able to take the student into protective custody without incident, police said. BRADENTON -- Bradenton's Gary Robinson, who grew up in Belle Glade, spent about 30 of his 51 years behind bars for various offenses, according to his family. But the past was all forgiven by his family Saturday night and into Sunday as about 20 family members held a roughly 30-hour vigil for him under the DeSoto Bridge spanning the Manatee River connecting Palmetto to downtown Bradenton along U.S. 41 and U.S. 301. The family said Robinson, a member of Bible Baptist Church in Palmetto, jumped from the bridge in an apparent suicide around noon Saturday. They waited all Sunday for authorities to find his body so they could be with him, said Robinson's mother, Bradenton's Essie Woods. By 6 p.m. Sunday, as darkness crept in, the body was recovered near the Green Bridge fishing pier, according to Palmetto Police Department Deputy Chief Scott Tyler. "He drove his truck up on the bridge then threw on the brakes," Woods said. "He got out with his Bible and yelled, 'Someone call 911 because I can't swim.' Then, he got on the rail and jumped. "I don't know why he did it," Woods added. The family said Robinson had been in great spirits of late. He was not depressed, they said. He was planning to get married in December to a Bradenton woman. "It's between him and God," said Jack Robinson, one of Gary Robinson's five siblings at the bridge Sunday, including brothers, Jack and Dale Robinson, and sisters, Luvonnie Hunter, Jacqueline Persons and Janet Robinson. After a daylight search Saturday, authorities from the Manatee County Sheriff's Office and Palmetto Police Department, along with a helicopter crew from Florida Fish and Wildlife Conservation Commission, resumed Sunday searching the Manatee River until just before darkness when the body was located. Gary Robinson's body will be taken to the Manatee County Medical Examiner's Office, authorities said. As they waited and scanned the dark waters, the family recalled a man who was a bright light, funny, friendly, caring, but who had also gotten in his share of problems. "On one hand you could call him a problem child because he was locked up a lot, in fact, about 30 of his 51 years, but on the other, he was a good guy," said brother Dale Robinson, who said burglary was one of his brother's problems. "I wasn't with him that much," Dale Robinson added wistfully of his brother. "He had been out of jail for about two years straight. To me, it wasn't like him to do something like this." When it comes to family, what is done is done and there are times that everyone must stick together. That is why the family waited together, they said. "Gary was fun, always smiling," said family member Iesha Vernett. "He was always positive." Gary Robinson's mother had been at the bridge all night.br> Gary Robinson apparently had a favorite niece out of his roughly 30 nieces: Kenyatta Foster of Fort Myers, according to Foster. Foster and Essie Woods stayed overnight at the bridge. She and other family members said Gary Robinson had recently "given his life to Jesus Christ." "He always had a joke," said his sister, Jacqueline Persons. "He was a Red Foxx copycat. He kept you laughing. If he were here now, he would say something to get everyone smiling." PALMETTO— Law enforcement officials confirmed they found the body of a man who jumped off the DeSoto Bridge on Wednesday. At 11:01 a.m. Thursday a Manatee County Marine Unit deputy spotted the body in the water near where the man is said to have jumped. Palmetto Police Deputy Chief Scott Tyler said they will not release any additional information about the individual at this time. The family of the registered owners of the vehicle left on the bridge Wednesday have been in contact with police and will make an identification of the body at the medical examiner’s office. The initial 911 call came in at 3:38 p.m. Wednesday when witnesses saw a man get out of his vehicle and jump in the Manatee River. Tyler said witnesses on the bridge saw the driver ram his white Volkswagen into the side of the railing in an apparent attempt to make it go over. When that he failed he stopped the car, got out and jumped over. Search and rescue crews from various agencies including Palmetto and Bradenton police, Bradenton Fire Rescue, North River Fire District, Manatee County EMS, U.S. Coast Guard and the Florida Fish and Wildlife Conservation Commission searched until sunset. The recovery operation, at it was deemed late Wednesday, resumed Thursday morning. PALMETTO -- Police identified the man who jumped off the DeSoto Bridge into the Manatee River Wednesday as 36-year-old Quincy Alexander of Bradenton. Alexander's body was found late Thursday morning by Manatee Sheriff's Office Marine Unit deputies.br> The initial 911 call came in at 3:38 p.m. Wednesday when witnesses say they saw a man ramming his vehicle into the railing in what appeared to be a failed attempt to drive off the bridge. Instead he got out and jumped over. Multiple law enforcement agencies helped in the search and rescue effort into late Wednesday and then again Thursday morning. At 11:01 p.m. Alexander's body was spotted in the water near where he jumped. Family identified the body when it was taken to the medical examiner's office.